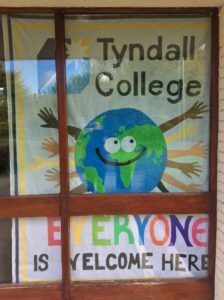 “Tyndall College, Everyone is Welcome Here”. This was the message echoing around the corridors of Tyndall College last week as we held our first ever Intercultural Week. The school now has students from 19 different countries, so it was decided that this had to be celebrated. 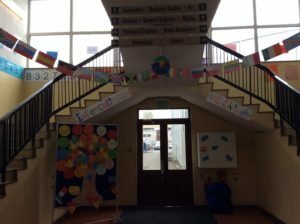 A colourful visual display of flags, greetings, fact files and a globe was put in place at the entrance corridor of the school with every country being represented. 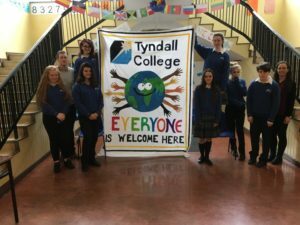 Many activities took place over the week including discussions, a céilí, Spanish dancing, quizzes, and students were also given the opportunity to sample food from some of the countries. 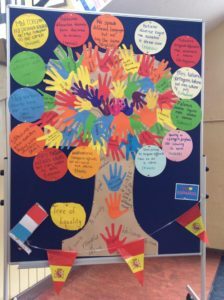 Students also worked on translating Hello and Welcome into the language of the 19 nationalities represented in the school and these were displayed around the school building. Some proved easier to pronounce than others! To conclude the week a Name that Flag competition was held for all years. A great week was had by all, and the students most certainly enjoyed learning about the cultures of their fellow students. 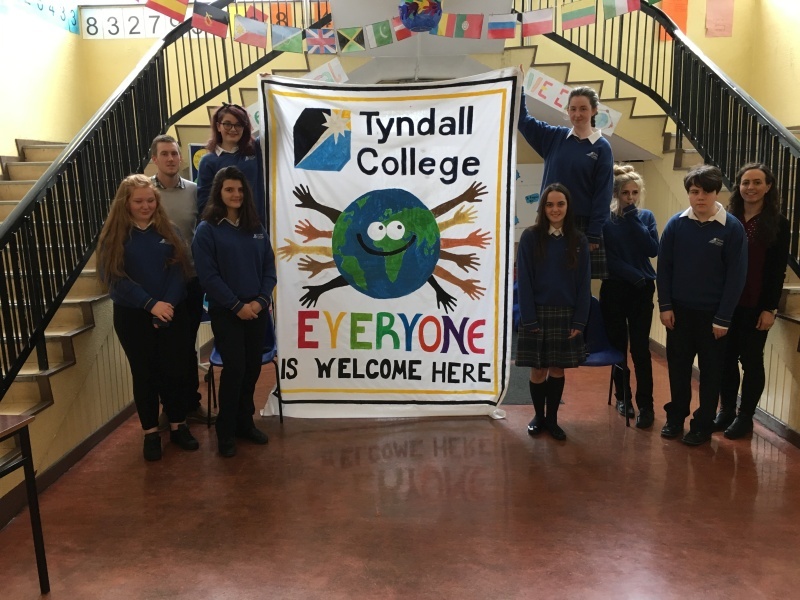 Casey McGrath, Giulia Martinez Perugini, Danielle Harkin Conway, Tracey Doogue, Hope de Faoite-Dickson, Ms Bolger and Mr Doyle unveiling the wonderful Intercultural Week banner they designed and created.